Hi! 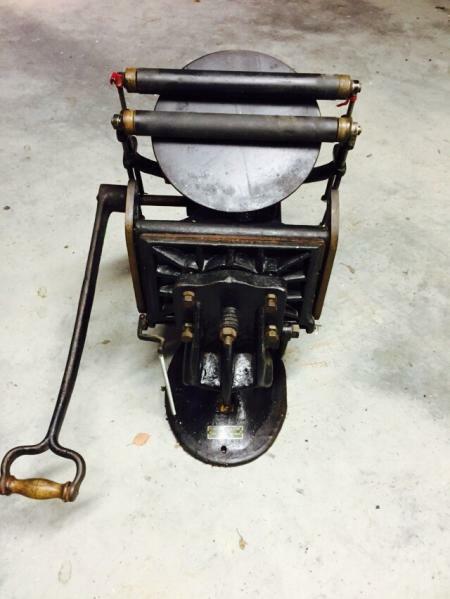 We bought this tabletop platen press a few days ago, and we’ve been trying to find some information about maker, age, model and value, but there’s no makers name anywhere on the press it self. There is a number, “1409” stamped on top of the back plate, just under the lower edge of the ink plate. We paid approx. $ 180 for the press. 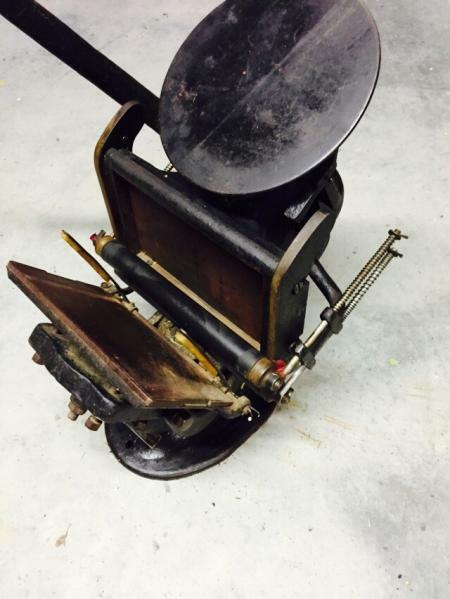 It looks like a Golding or Sigwalt, but there are some differences in all the pictures we’ve found so far..
Really hope you can help us to learn a bit more about our press, since we’re now too busy cleaning it up, and trying to learn how to print with it. I’ve run across several Sigwalt clones through the years. Your looks like a nice little machine. 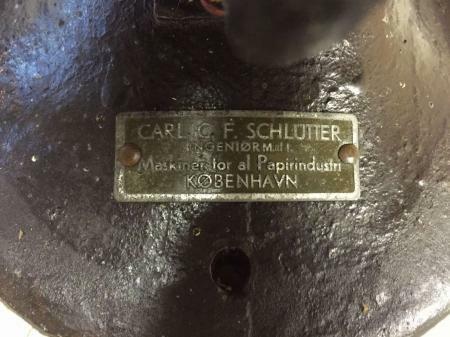 The press has probably been relabeled by the distributor, in this case Carl C. F. Schlütter. We’ve been unable to find any information about his business. So just a clone of Sigwalts Golding clone, then? I’m quite sure it is neither an Official nor a Sigwalt. 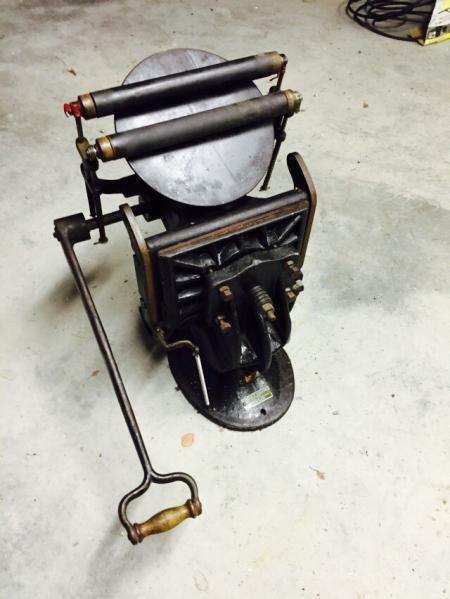 Both, or at least the Official and the earlier Sigwalt Nonpareil, have round bases, whereas this press has an oval base. 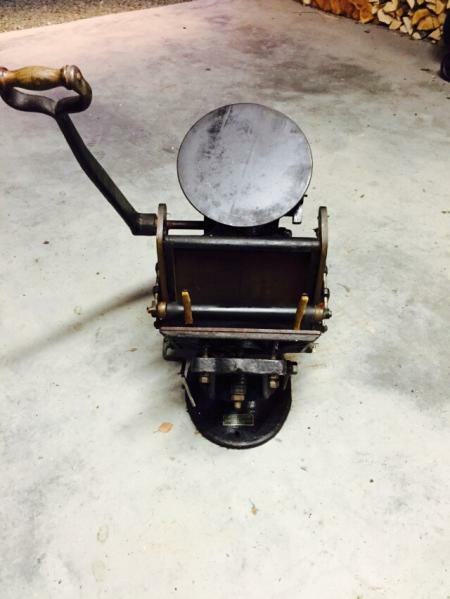 Also, both the American-made presses had the handle attached snug against the frame boss from which the shaft emerges, whereas on this press that portion of the frame is more recessed and the shaft is quite long in order for the handle to clear the bed. I would agree it is a European clone, a “Boston Tiegel”, and the attribution is undoubtedly correct. We stock everything you will need to print with it…furniture, quoins and keys, tympan, gauge pins, type, planer, brayer…no ink or paper!! Can put a small kit together for you. Thanks for the comments! 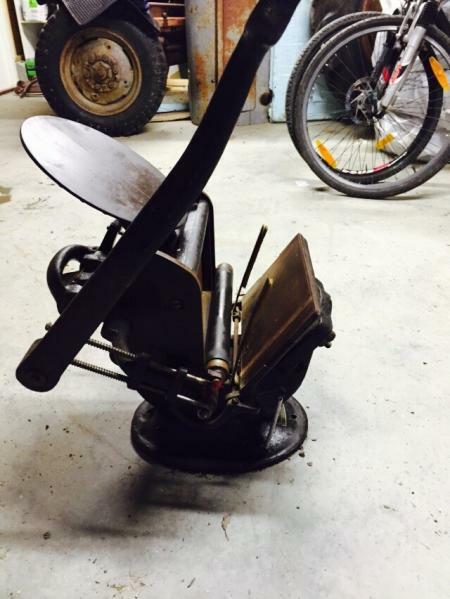 I’ve never heard about the Boston Tiegel type, but it looks a lot like our press, I’ll check it out some more. The press itself allso looks a lot better after a good clean up, and makes great prints from the few linocut try outs we’ve had so far. Really hard to find types, or a photopolymer supplier here tho. And thanks, Larry, but we’re located in Norway, and I believe shipping costs would just as much as the actual price for the equippement? Hello Einark, Tiegel is the German word for platen and Boston indicates the way the platen moves. Good luck and good printing!